Timothy Walker is a 4th degree 2nd generation Ed Parker black belt and a 1st generation black belt student of 10th degree black belt Lee Wedlake. Tim Walker was first introduced to the martial art of Kung Fu through a parks and recreation department in the late 70's. In 1980, he joined a Korean karate school that was ironically teaching kenpo self defense techniques. Two and one half years later, 1983, while searching for a school whose priority was instruction geared for street encounters instead of sport tournaments, Mr. Walker enrolled in a Shaolin Kempo school. As a Kempo brown belt in 1985, he started teaching children and adult classes. In January of 1986 he was awarded his 1st degree black belt in Shaolin Kempo, then in December of 1987 he was promoted to 2nd degree black belt. In June 1989 he was promoted to the full instructor rank of 3rd degree black. Moving to Lee County, Florida, the Walker family met 1st generation Ed Parker Kenpo Karate black belt Lee Wedlake Jr. In EP American Kenpo, Tim found a martial art dedicated to teaching self defense for today's world. So when Lee Wedlake opened his kenpo school in Fort Myers in January of 1992, Mr.Walker was one of the first students to enroll. 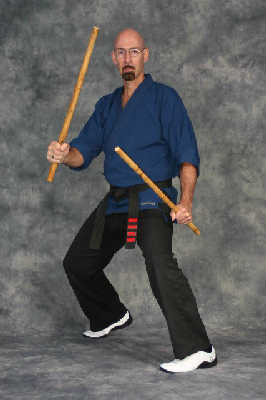 belt, Head Instructor, in May of 2003. Retiring from his job of over 20 years in retail sales, retail theft, and loss prevention, the Walkers Tim, children Rachel and Joshua relocated to North Florida. With his families support, he opened his own Kenpo Karate school in the town of Branford, Florida in May of 2004'. Mr. Walker has also been teaching in public schools in the tri-county area since 2004' and is currently employed at Fort White Elementary School. With over 39 years of Martial Arts education, Tim Walker touches lives while conducting fun, positive and educational classes that are enriched with positive motivation and praise. AKKU Inc. teaches age specific classes. We have 4-6 yr old, 7-12 yr old, teen and adult classes available.